ARCA Full Contracting Members can sign-up for the 'Member Internal Site Audit App', so their internal site audits use the same question set as the ARCA audit. Enabling direct comparisons of external and internal audit results, providing a strong management tool. For asbestos removal contractors to run an effective audit programme it is good practice to undertake both internal and external audits. However, often these two elements can differ in what is audited, limiting the scope of analysing the audit results collectively. The App is a web and remote device based application enabling auditors to audit using a number of handheld platforms: Apple iOS (iPhones/iPads), most Android (phones/tablets), Kindle Fire and Windows tablets. The App is user friendly, incorporates guidance with each audit question, can be used on sites even with no internet connection and generates reports which include the photographs taken on the device used. Also, management is enhanced as results, from all audits, can be displayed graphically to assist analysis. The pricing, for a single user and multiple users, is included on the booking form and full 'terms and conditions of use' are available here. 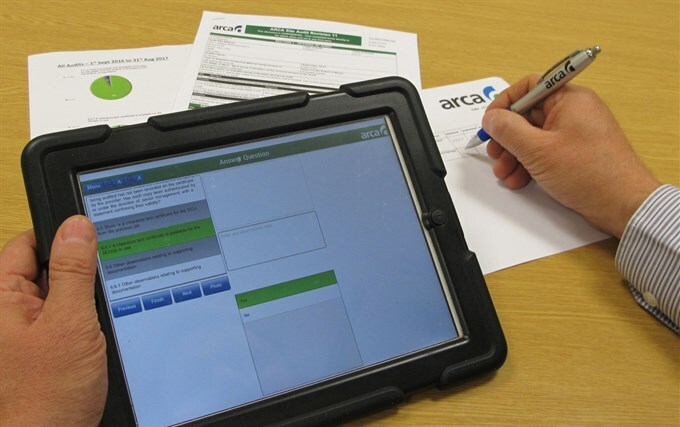 Make your site audit programme effective with the ARCA member internal site audit app.